The national CUE conference was held two weeks ago in Palm Springs and it was amazing. The mission of CUE is to inspire "innovative learners by fostering community, personalizing learning, infusing technology, developing leadership, and advocating educational opportunities for all." 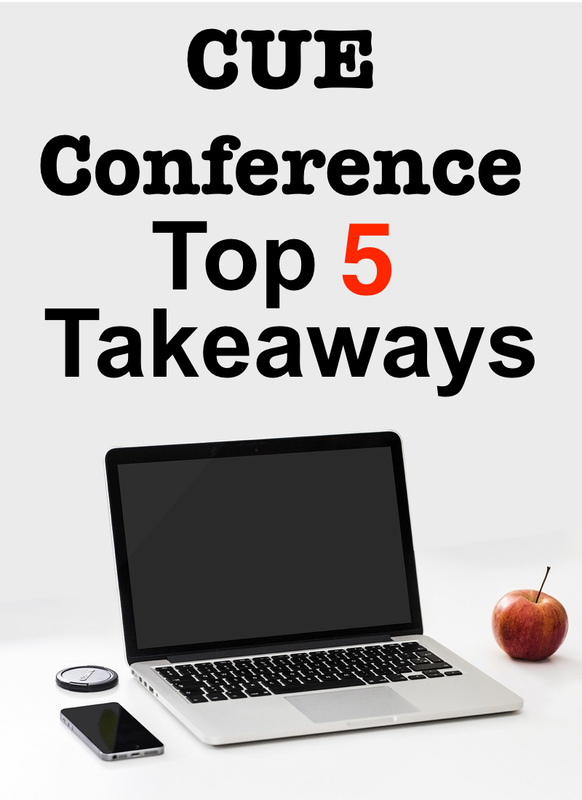 Here are my 5 Big Take Aways from the conference. Throughout the conference it was very evident that the presenters believed in their students. They were challenging their students to do amazing things. To think deeper, to tackle difficult concepts, to create products that seem above their capabilities. It was amazing to see the products that students can create when given the support, time, and encouragement that they need. Technology should not be used just because you have it. It needs to enhance your instruction. Technology is more than just a way to have students do word processing or make a presentation. Students can use it as a fun way to review the topics. It can be used to give the students the basic information before they go deeper into the information in class. They can interview and talk with experts and do simulations. They can create videos and other products that take them beyond a simple presentation. As we become more comfortable with technology we create a lot of the activities that our students will do like online videos and games. What if we allowed the students to become the creators. Let them create the videos. Let them create the games. Have them make their own interactive digital reviews that fellow students can learn from. Don't try and take on too much at once. Start small and build from there. Get comfortable with a few technology applications and then build from there. For some that means just starting out using Google Classroom and assigning students Google Drive assignments. From there they might add a few online review games or online assessments. I know when I went to a blended learning classroom I started out by only doing a few station rotations for a couple of units. Then I went to doing it for most units. Eventually I added the flipped classroom model as well. If you try to much it will be very overwhelming. There were so many session on how to incorporate video into your classroom. Many were about having students show their understanding by using videos to present their claims, evidences, and reasonings. My two favorite session came from Doug Robertson otherwise known as The weird teacher and Maggie Mabery. Both of their sessions were about empowering students to demonstrate their understanding by creating videos.